Sometimes on facebook, you will see posts on your timeline which you would like to share. Unfortunately you see that there is no “share” button available that you can click on. This is caused by the writer of the post choosing to only share their post with “friends except” or that you are reading a post that is in a closed group. The way around this, is to click the pull-down menu on the top right hand corner of the post. 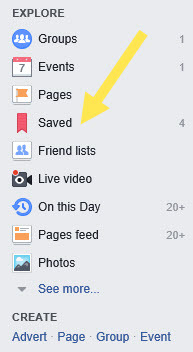 There you will see an option to “save post”. 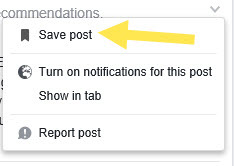 Once you have saved this post, you can click on the link to your saved posts and there you will have the option to share the post to your timeline.